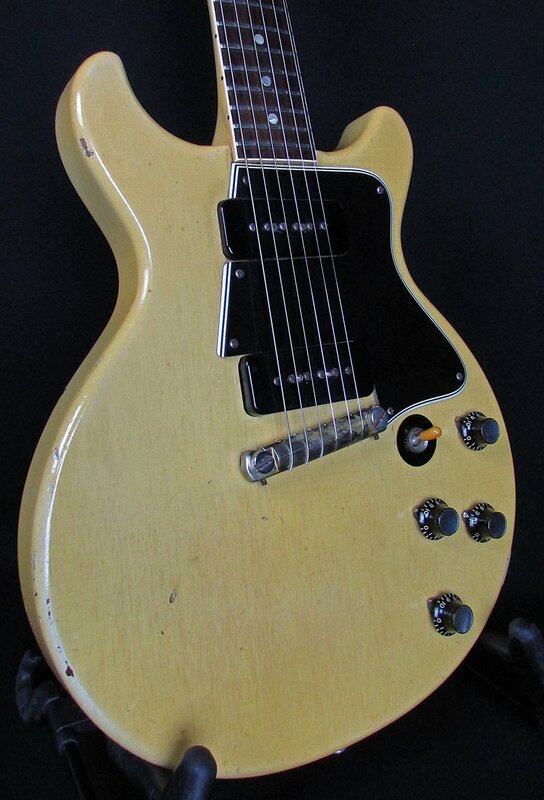 1960 Gibson Les Paul Special is in amazing condition and perfect playing order! This gorgeous Les Paul Special is, with the exception of the period correct aged reproduction tailpiece, all original! No breaks, no cracks, and no repairs! The neck is straight and it plays like a dream all the way up! Throughout it's 58 years of life, it's been well loved and well played. It has all the normal wear one could expect to see. There's some dings, dents, and bonks all around the body. It has a shallow ding in the neck behind the 1st fret at the B string, but it's near impossible to feel while playing. The tips of the head stock wings have been worn down a little over the years. The original frets have average playing wear for a guitar of it's age, yet it doesn't cause any playability or buzzing issues. Has some very shallow buckle rash on the back as well. It's got a ton of finish checking all over the body and neck, it's all real thin checking. Constructed from a 1-piece Honduras mahogany body with a set 60's slim profile Honduras mahogany neck, and bound Brazilian rosewood fretboard. The stock soapbar pickups read 8.97k in the bridge and 8.74k in the neck. Has a 1 11/16" standard 24 3/4" scale length, and weighs 7 pounds 13 ounces.